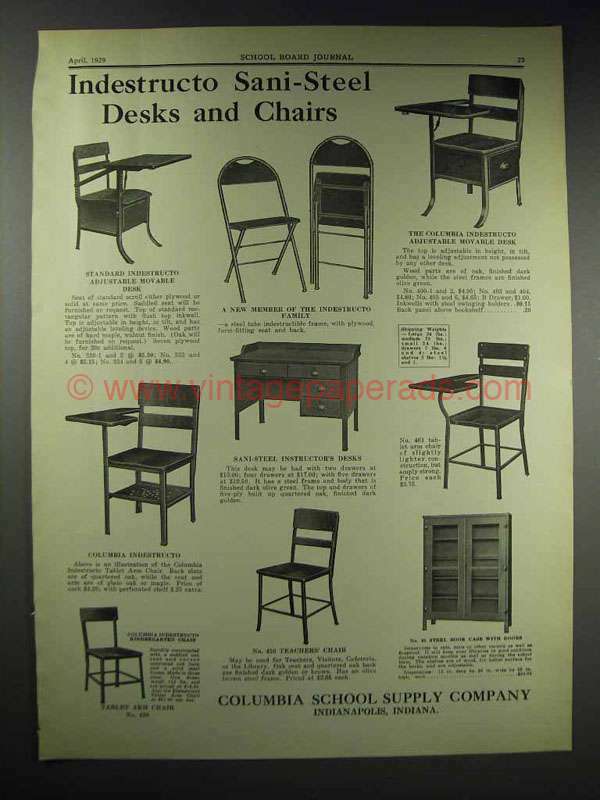 This is a 1929 ad for a Columbia School Supply Company: Standard Indestruto Adjustable Movable Desk; Columbia Indestructo Adjustable Movable Desk; Indestruto; Sani-Steel Instructor's Desk; No. 461 Tablet Arm Chair; Indestructo Kindergarten Chair; No. 450 Teachers' Chair; No. 65 Steel Book Case with Doors! The size of the ad is approximately 10x13.5inches. The caption for this ad is 'Indestructo Sani-Steel desks and chairs' The ad is in good overall condition, with some light wear. This vintage ad would look great framed and displayed! Add it to your collecction today!